Props to Helene for this post idea. I love to talk about my cats but I don't really talk about them, so I thought I would let you all get to know them better (you're welcome). KC: 'we should name her something easy and quick, like Penny'. Me: 'Ok'... 5 minutes later 'Penny it is'. We had Chelsea for like a day before we settled on her name. We almost went with Marie (Aristocats) and something else I don't remember. I looked up, saw a photo of us at a Chelsea game (KC's favourite soccer team) and suggested it, because her eyes were blue. KC called her 'squirt' for the first 6 months or so, glad that didn't stick. Really wanted to stick with the 'e' ending. I can't remember what we 'almost' named her, but we called her that for a few hours and then I was like 'nope, don't dig it'. Suggested Millie, KC wasn't a fan, but I kept going. Got it from Seven Brides for Seven Brothers, naturally. So there you, they are the cats behind the blog. I really love these little rascals, they are my family and they love me more than I deserve. I'm thankful for my babies. We've had such good luck finding the perfect fit for our family that we are definitely done now, don't want to disrupt what little balance we have. They like each other most times, love KC and I almost all the time and rarely cause issues. They sit in my lap and across the laptop while I am trying to blog, so basically they are bloggers too. This is too cute. Funny how different their personalities can be. Such adorable little kitties. What a fun idea! And 7 Brides for 7 Brothers was such an awesome movie!!! I have an aunt named Penny, for pretty much the same reason. When we got our dog, I made a huge list of potential names, but then his name at the shelter was Luke, and he really was too whiny to be "Han Solo" so we ended up just keeping it. Haha love this! Such cute, fluffy kitties! Love that Chelsea likes car rides and Millie likes everything you aren't supposed to do! That sounds like my dog haha! And Chelsea does have gorgeous eyes! Happy Monday girl! Awwhhh I love this idea! Might have to make a little profile for my dog. They're all so lovely. 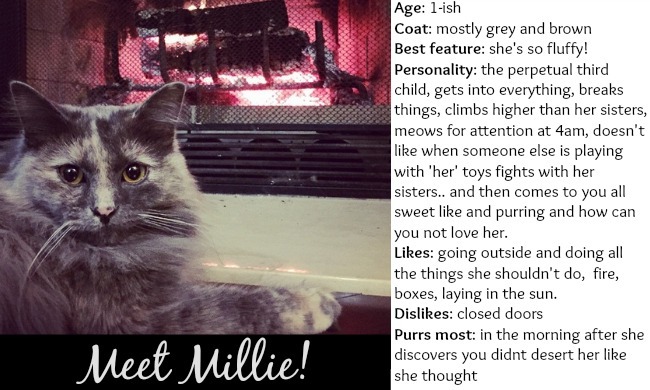 Millie sounds like quite the character haha I know what you mean about balance. We only have one dog, but I really don't know how well she'd adjust to another dog and I don't want to mess with our arrangement as I'm quite pleased with how it is. This is so fun. I have a tuxedo cat too, only he has been sick for 2 weeks. They are adorable! I love their names...so cute! You have THREE cats?! That's a lot of cats... It's ok. I still like you. Haha I love Millie's story! Sounds like she just loves her momma!! Hope you had a good weekend! I feel like an idiot because I didn't realize you had THREE cats! I have seen you post their pics on Instagram but always thought it was the same cat (or maybe there was a pic where two of them were together?) Anyway LOL at their dating profiles and I'm glad you shared their name origins because I was going to ask!! ha! Hahah this is hilarious! You have so many fur babies. haha this is amazing!!! love love love it!!! I love this! Chelsea is my favorite since she likes the car! Road trip!!! They are so adorable! I love the stories behind their names because I love stuff like that and it always amazes me how animals are like people with their different personalities. Oh your kitties are so adorable. Great post. I love this!!! I know my dogs have completely different personality profiles! So fun seeing how each of them are and hearing the stories behind their names. Makes me miss my little Livvy!!! 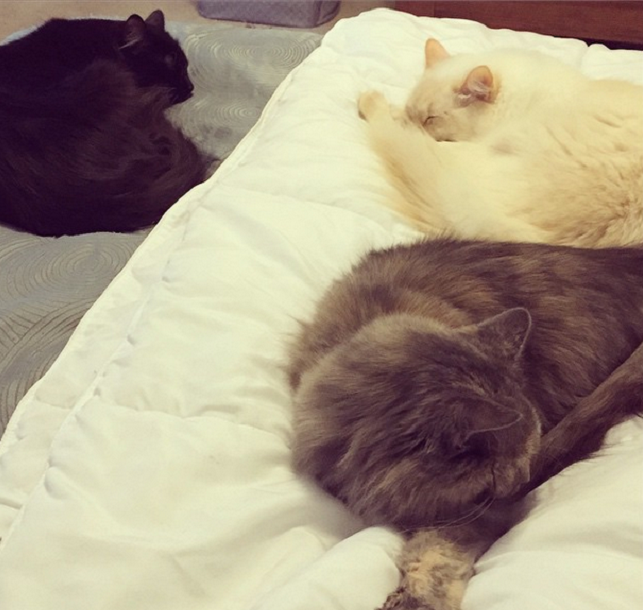 I'm so jealous of you and all your cats! I need at least three more. One doesn't feel like enough. This is such a cute post! I was going to comment on their names so it was fun to scroll down and read how you came up with all of them. Such pretty girls! I love this idea. Your babies are beautiful! I love how all animals in general have their own little personalities! I love this... I am def going to have to make a profile for my dog. My kids want a cat so bad, your posts always make me want to give in! Hehe I love this post! I love that pets all have such different personalities! Oh my gosh... this post is perfect! How funny!! Too cute! They're all gorgeous. They should be able to find dates in no time. This is so funny! I love this post, Happy Monday! Sooo cute!! They're all so pretty!! I guess I should've had all girls, cause my boys just aren't cuddly. This is awesome! My cat is such a sassy fat alcoholic I don't think anyone would be interested in her dating profile. Your cats are so beautiful! They are so precious!!! Penny's whiskers wow!! And Chelsea's eyes! and Millie's thick coat. Three of the cutest cats Ive ever seen no joke. My aunt in Australia (one of my uncles ex-wives) has a reeeeeaaaaly fat and fluffy cat that I actually loved (but didn't love me duh) you cats make me think of her! This gets me so excited for my link-up. I want to read about ALL the fur babies! I want to snuggle them too, but if I have to settle for reading about them...such as life (see what I did there.) 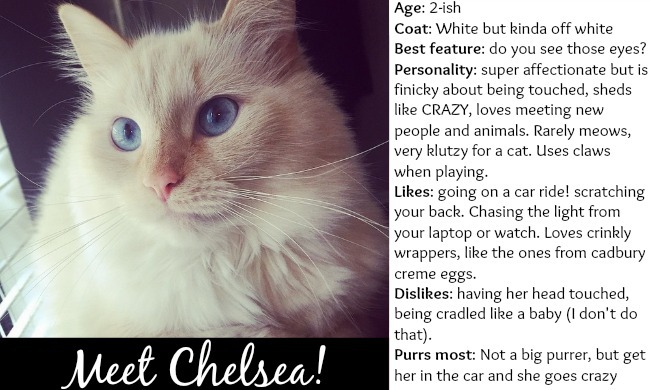 I love the story of Chelsea's name. After all, her eyes are Chelsea Blue! Lol, I love this! Your little babes are so cute...I want to snuggle all of them! hilarious. love that you did this for your cats! such little personalities! This is absolutely hilarious! Please write more things like this! I should do this for my dogs! I went to go get a cat a year ago and walked out with a dog, but here's to hoping I get one, one day! Yes to Chelsea (Eric's favorite soccer team as well). Yes to Seven Brides for Seven Brothers (I LOVE that movie...made Eric watch it, he wasn't excited about it). And yes to this whole post. Hilarious! This is hilarious! YES MARIE FROM ARISTOCATS! I love it. I loved that movie!! Cute profiles! Chelsea is gorgeous! Love this!! They are all SO cute! The picture of them all sleeping is so sweet!! Chelsea likes going in the car!! I always put Eddie in his carrier for car rides, but he does not seem to love it, he usually gets all puffy and gets into the corner of it. Though he did seem to relax some during our long cross-country drive. This is awesome! I want to do it for our dogs! Animals are totally family and I'd be so lost without ours. Please give me more on the fire though. Seems dangerous! Your cats are so adorable! Mine are definitely family members as well. Life without them would be so sad! This is SO cute! haha. Did you get them all at separate times? We just got a new cat and our first is NOT having it! Do you have any tricks for getting them to like each other? ?